Here are some of the most common concerns reported to Seattle Times Traffic Lab, and what the Washington Department of Transportation says about them. 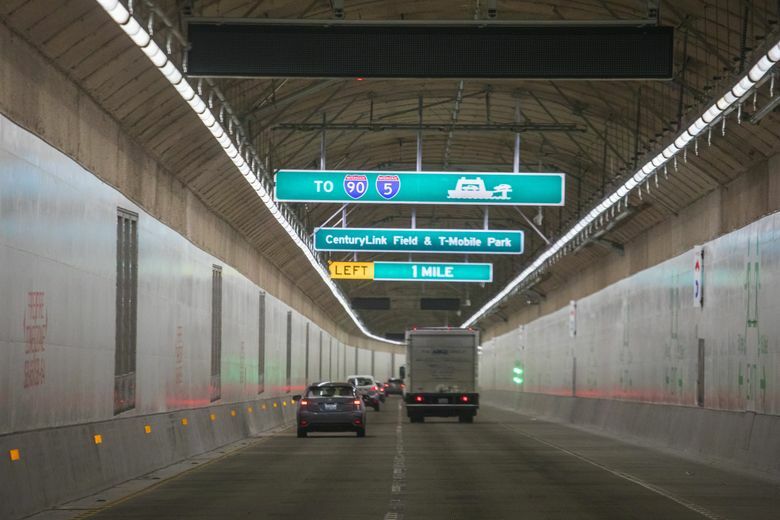 Since the Highway 99 tunnel opened to traffic Feb. 4, drivers have been largely impressed by some faster commutes and the bright, well-lit interior. Traffic is slowly creeping up as well. About 64,000 vehicles used the tunnel on Feb. 25, rising to about 69,000 two days later, the state traffic-control center reported. That’s still well below the 97,400 vehicles per day the state forecast the tunnel would serve before tolling goes into effect. But drivers do have complaints, which they shared when Traffic Lab asked readers for their thoughts on how the tunnel is working. Here are some of the most common concerns, and what the Washington Department of Transportation (WSDOT) says about them. Newborn said the concrete roadbed is “grooved to help with traction,” and speculated that the grooves may be what people are feeling. The northbound and southbound sections were constructed differently, but Newborn didn’t think that would contribute to the bouncing feeling some drivers are experiencing. Crews built the lower, northbound lanes using precast concrete panels while the upper, southbound lanes were cast into place, behind the tunnel-boring machine Bertha as it traveled under Seattle. Bottom line: Drivers need to get used to the roughness because the grooves are here to stay. The signs on the old Alaskan Way Viaduct directed northbound drivers toward Western Avenue and Aurora Avenue North. Southbound drivers on the viaduct were told to stay in the right lane, to make a right-side exit to Interstate 90, Interstate 5 and the stadiums. Other signs indicated where to get off to get to the ferries and to Pioneer Square. There are no downtown exits inside the tunnel so there’s no need for most of those signs, Newborn said, but drivers may have trouble orienting themselves because there aren’t visual cues of Elliott Bay and the stadiums that the viaduct provided. When heading south on Aurora Avenue, the left-most lane leads drivers toward Denny Way, Seattle Center and downtown, while the two right lanes enter the tunnel. Transit heading south on Aurora uses a bus-only lane that ends before the tunnel entrance. Buses stop on the right side of the road to pick up passengers, but then exit to Denny Way and downtown via the left lane instead of using the tunnel. That forces buses and cars to crisscross over busy lanes to get to their exits. This design dilemma occurs because when lawmakers approved the tunnel in 2009, transit was not as popular as it is today. To handle the number of buses now using the route, engineers extended the left-side exit from Aurora, and moved the last E Line stop up, more than a half-mile, to Galer Street to allow more room for buses to merge. Drivers and bus riders also are contending with ongoing construction as part of the tunnel project, aggravating congestion south of Denny Way to Harrison Street. Aurora Avenue between Denny Way and Harrison — now called Seventh Avenue North — has been shrunk to one lane in each direction while work crews use the inside lanes as they decommission the Battery Street Tunnel. Later this year, the bottleneck will continue as WSDOT rebuilds Aurora (Seventh Avenue North) between Denny Way and Harrison and re-connects Thomas and John streets, which were severed by Aurora. Complicating that problem is the congestion on Aurora Avenue — now called Borealis Avenue — just south of Denny. When drivers turn right off Sixth Avenue into the northbound general-purpose lane of Borealis, the line of cars often blocks the northbound bus lane. Buses on routes 28, 26 and the E Line can’t reach riders waiting at the Elephant Car Wash bus stop. A bill that would allow Seattle to use automatic traffic cameras to ticket cars blocking bus lanes and crosswalks passed out of the state House transportation committee last month. Finally, some readers suggested poor signal timing at Denny and Aurora, as well as a new traffic light at Harrison and Aurora, as contributing to the congestion. As part of the tunnel project, a light was added at Harrison because “this intersection is the only place to cross Aurora between Denny Way and Mercer Street,” said Ethan Bergerson, a spokesman for the Seattle Transportation Department (SDOT). The signal allows drivers east of Aurora Avenue to reach the tunnel entrance, drivers west of Aurora to access Highway 99 northbound and drivers who are coming from southbound Highway 99 to access South Lake Union, he said. The Seattle Police Department is responsible for law enforcement inside the tunnel. Its traffic unit has been enforcing the 45 mph speed limit, said spokesman Jonah Spangenthal-Lee, but the agency was unable to provide numbers on citations issued. According to Washington law, automated speed enforcement cameras are restricted to railroad crossings and school zones. To put them inside the tunnel would require a change in state law.